Over the Labor Day holiday weekend, we went to Colorado. I love the scenery, the mountains, the dry air and pretty much everything about it. We have family and friends who live in the Denver area so we always have a great excuse to visit there. We had a wonderful trip, but then reality sets in! Love four-day work weeks unless I’m cramming in five days worth of work which is how it was this week. 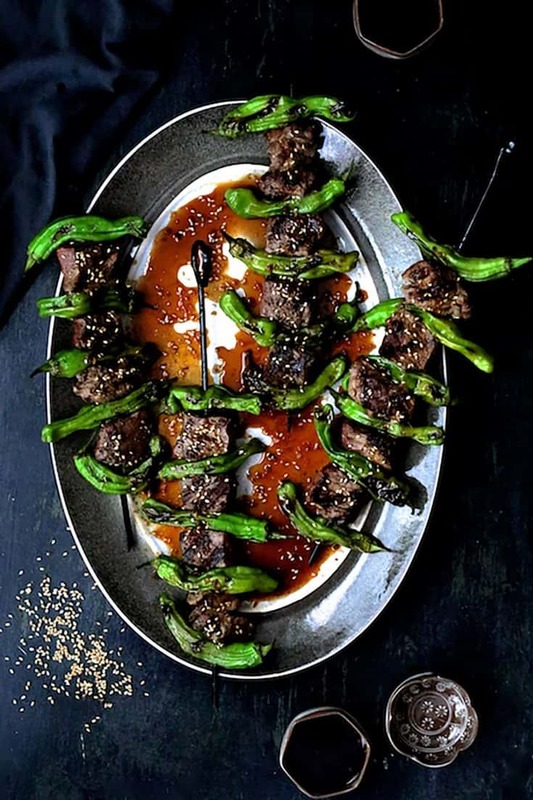 My Japanese Beef and Shishito Pepper Skewers are quick, easy, sophisticated and taste like they took more work than they actually did. They’re perfect for an easy Asian-inspired weeknight meal. I’m a little late to the shishito pepper party because I couldn’t find them in my area. I then saw them on the menu at a local restaurant as an appetizer with corn and cheese so tried them. I was less than impressed. It was like eating a pile of green bell peppers with corn and cheese. Green bell peppers, corn and cheese all have their place, but not together as an appetizer. 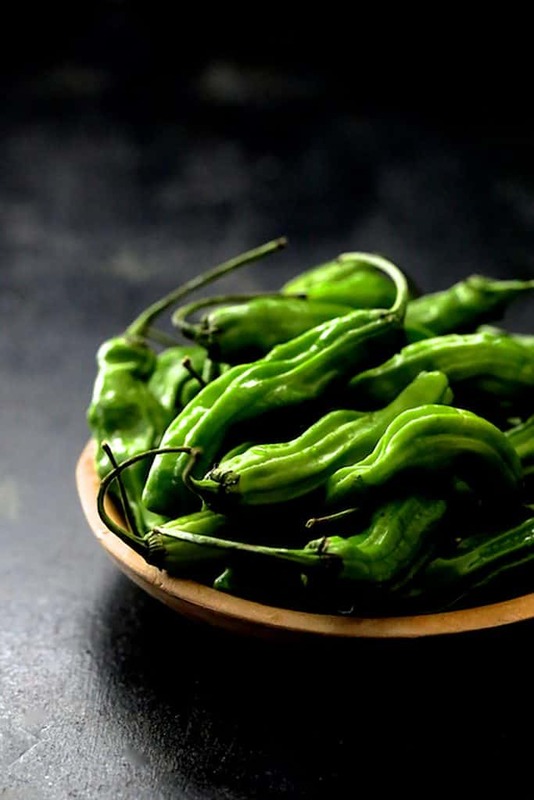 Shishito peppers are Asian and require pairing with Asian flavors. They tend to be mild, but every so often, you will get a hot one! The Kroger I shop at began carrying them recently and I decided to give them a second chance. I love that in a recipe such as this, you can simply thread them onto skewers whole with the beef. I love that you can pick them up by the stem and pop them whole into your mouth. No cutting, chopping or prep involved! As for the beef, I used tenderloin, but you could use rib eye or sirloin. Every so often, I’ll buy a whole beef tenderloin on sale and have the butcher trim it and grind the trimmings for burgers. The price per pound will be much better than buying individual steaks. We’ll enjoy a couple of steaks on the grill and freeze the rest. It’s only the first weekend in September so there’s still plenty of grilling season left. These work equally well on a grill pan for when you can’t grill outside. You don’t need to marinate the beef at all. Simply combine a few basic Asian ingredients, simmer gently to melt the sugar and soften the ginger then drizzle over the beef when ready to serve. Garnish with sesame seeds and serve the remaining sauce on the side for dipping. How easy is that? Enjoy! Whisk soy sauce, rice vinegar, brown sugar and ginger together in a small saucepan. Bring to a boil over medium heat to dissolve the sugar and cook the ginger. Add the chili garlic sauce. Keep warm. 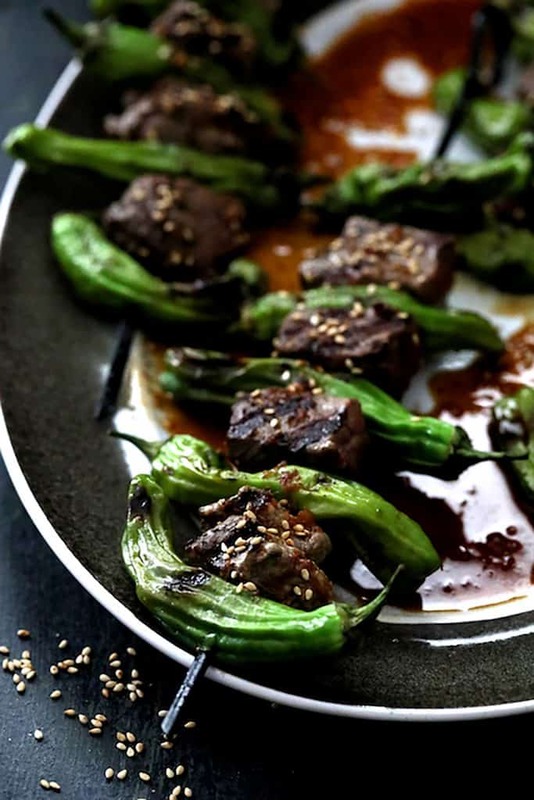 Starting with a shishito pepper, thread the peppers and beef onto skewers, alternating them. Brush the skewers with oil and season to taste with salt and black pepper. Preheat a grill or grill pan over medium-high heat. Grill 4-5 minutes per side or to medium-rare / medium. Transfer the skewers to a platter. 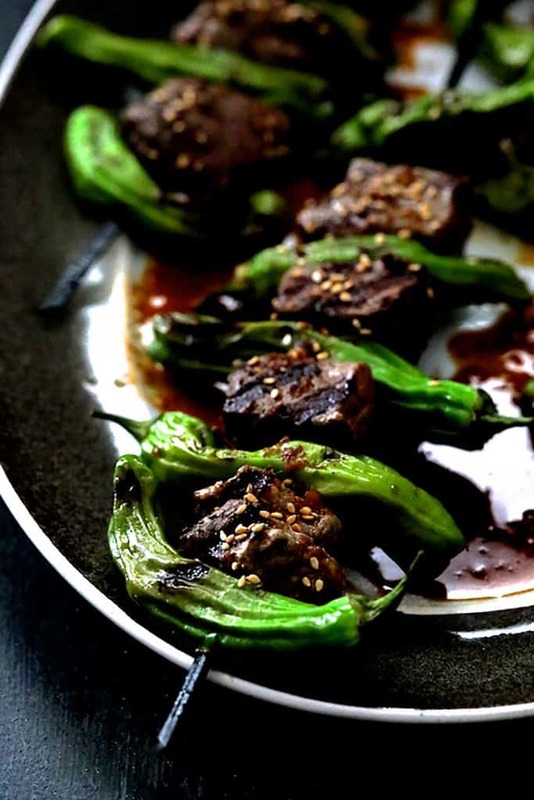 Drizzle with the sauce and garnish with sesame seeds. Serve remaining sauce on the side. Rib eye or sirloin may be used in place of the tenderloin.